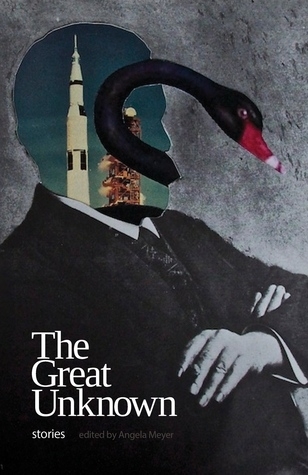 The Great Unknown is a collection of 19 short stories by Australian writers. According to Angela Meyer, the editor, “it was while watching the original series of The Twilight Zone that the book… was born.” “The strange, the absurd, the macabre, the speculative and the fantastical” nature of these stories, saw them chosen and compiled as examples of the kind of influence American television programmes like The Twilight Zone has had on contemporary Australian writers. The stories encompass a broad range of subjects, from the experiences of an elderly woman’s pet parrot (Bluey and Myrtle, by Mark O’Flynn), to a crazy satnav directing a woman to the site of her grave (Navigating, by Helen Richardson), giant hares and witchcraft in country Victoria (Hare, by Carmel Bird), to a hell in the form of a Jerry Springer-esque television show (Paddy O’Reilly’s Reality TV). All of the stories utilise a plot twist, ala The Twilight Zone, either as the ending or as the means of moving the story forward. The book begins with Krissy Kneen’s Sleepwalk, the story of a photographer taking pictures in her sleep. What she and her partner find when the photographs are developed, and the anxiety this causes them (not to mention his implied grisly end), is a good signpost to the chilling stories to come. By way of a somewhat clichéd, though tried-and-true twist (true, at least, in the traditions of The Twilight Zone), the protagonist in Chris Flynn’s Sealer’s Cove suddenly finds himself inexplicably two centuries in the past, captured by a group of pirates. When he escapes and gets back to what he thinks is reality, he finds he has a particular memento of his experience that he has no way of explaining. While interesting as a dig at society’s obsession with sporting “heroes” and the farcical, hypocritical reality of celebrity and American TV culture which pervades Australian television, I found Ali Alizadeh’s Truth and Reconciliation somewhat contrived and overly simple, the metaphors and analogies a little too obvious. I felt this story, clearly based on the cyclist Lance Armstrong’s confession – of having used performance-enhancing drugs – on the Oprah Winfrey show, didn’t necessarily fit with “the strange” or “the fantastical” themes of other stories in the book. Nor did I think this story matched the general air of Australianness in many of the other stories in the book. Rhys Tate’s The Koala Motel does this well. More X-Files than The Twilight Zone, The Koala Motel is definitely in keeping with the theme of “the strange, absurd and macabre”. Using setting, slang and vocabulary Tate presents a very Australian story, like a ripping campfire horror yarn rewritten for a literary audience. Mainly dialogue based, the main character recounts to another the tale of a little boy who, together with his blue tricycle, vanished without trace from an isolated motel some years ago. The character then details his own recent experience, late at night, of hitting something in his car near the derelict motel, and of hearing the sound of a crying child coming from inside the motel kitchen. Damon Young’s Art and The Rift, by Chris Sommerville, like Sleepwalk and The Koala Motel, also come to shocking, abrupt climaxes, leaving the reader with much to ruminate on. Similarly, Baby’s First Words, by Kathy Charles, and, A Void, by Guy Salvidge, leave much up to the reader to decide for themselves, to interpret as they like, and leave lots of loose threads to ponder and pick at; not only “what happens next?”, but “what came before?” But it is all cleverly implicit; nothing is stated definitively. In P.M. Newton’s The Local, for example, there is passing mention of a husband who “went into the rainforest and never came back out,” but it is left to the reader to decide whether this could have been something sinister or just another tree-changer losing his mind to dope smoke, or even UFOs. In the case of The Koala Motel (probably my favourite in the book) it is whether the motel was really haunted, whether it was something else, or whether the main character was simply drunk and imagined it. None of the stories in The Great Unknown is doing anything particularly ground-breaking or new. True: these are all very original, truly unique stories. But all conform more or less to traditional narrative structures; told chronologically, following linear plotlines, and using classic horror and weird fiction story plot devices. Like all good books, however, and true to the weird and wonderful tales told on The Twilight Zone, the stories in The Great Unknown leave the reader to ponder what has really gone on, and for me, as an aspiring writer, it is the questions left unanswered, that keep the reader thinking long after they have finished reading, that make a story the more entertaining, for the thoughts and ideas they inspire. The Great Unknown is a good book and I will be reading it again. Meyer, A 2013, ‘Blog: The story of my book: The Great Unknown’, available at: http://www.readings.com.au/news/the-story-of-my-book-the-great-unknown, accessed 29 Jan 2015. Meyer, A 2013, ‘The Great Unknown’, 1st Edition, Sydney, Spineless Wonders.